Francis Ford Coppola (/ˈkoʊpələ/, Italian: [ˈkɔppola]; born April 7, 1939) is an American film director, producer, screenwriter and film composer. He was a central figure in the New Hollywood filmmaking movement of the 1960s and 1970s. After directing The Rain People in 1969, Coppola co-wrote Patton (1970), earning the Academy Award for Best Original Screenplay along with Edmund H. North. Coppola's reputation as a filmmaker was cemented with the release of The Godfather (1972). The film revolutionized movie-making in the gangster genre, and was adored by the public and critics alike. The Godfather won three Academy Awards: Best Picture, Best Actor, and Best Adapted Screenplay (shared with Mario Puzo). The Godfather Part II, which followed in 1974, became the first sequel to win the Academy Award for Best Picture. Highly regarded by critics, the film brought Coppola three more Academy Awards: Best Adapted Screenplay, Best Director, and Best Picture, and made him the second director (after Billy Wilder) to be so honored three times for the same film. The Conversation, which Coppola directed, produced and wrote, was released that same year, winning the Palme d'Or at the Cannes Film Festival. His next film, Apocalypse Now (1979), which notoriously had a lengthy and strenuous production, was widely acclaimed for its vivid depiction of the Vietnam War. The film won the Palme d'Or, making Coppola one of only eight filmmakers to have won that award twice. While a number of Coppola's ventures in the 1980s and 1990s were critically lauded, he has never quite achieved the same commercial success with films as in the 1970s. His best-known films released since the start of the 1980s are the dramas The Outsiders and Rumble Fish (both 1983), the crime dramas The Cotton Club (1984) and The Godfather Part III (1990), and the horror film Bram Stoker's Dracula (1992). A number of Coppola's relatives and children have become famous actors and filmmakers in their own right: his sister is the actress Talia Shire; his daughter Sofia Coppola and granddaughter Gia Coppola are actresses and directors, and the actors Jason Schwartzman and Nicolas Cage are his nephews. The Godfather Part II is ranked as the No. 1 greatest movie of all time in TV Guide's "50 Best Movies of All Time" and is ranked at No. 7 on Entertainment Weekly's list of the "100 Greatest Movies of All Time". The film is also featured on movie critic Leonard Maltin's list of the "100 Must-See Films of the 20th Century", as well as Roger Ebert's "Great Movies" list. It was also featured on Sight & Sound's list of the ten greatest films of all time in 2002, ranking at No. 4. The last film Coppola directed in the 90s, The Rainmaker, was based on the 1995 novel of the same name by John Grisham. An ensemble courtroom drama, the film was well received by critics, earning an 83% rating on Rotten Tomatoes. Roger Ebert gave The Rainmaker three stars out of four, remarking: "I have enjoyed several of the movies based on Grisham novels... but I've usually seen the storyteller's craft rather than the novelist's art being reflected. By keeping all of the little people in focus, Coppola shows the variety of a young lawyer's life, where every client is necessary and most of them need a lot more than a lawyer." James Berardinelli also gave the film three stars out of four, saying that "the intelligence and subtlety of The Rainmaker took me by surprise" and that the film "stands above any other filmed Grisham adaptation". Grisham said of the film, "To me it's the best adaptation of any of [my books]... I love the movie. It's so well done." The film grossed about $45 million domestically. This would be more than the estimated production budget of $40 million, but a disappointment compared with previous films adapted from Grisham novels. He had planned to direct an epic movie named Megalopolis, a story about the aftermath and reconstruction of New York City after a mega-disaster, but after the city was hit by the real life disaster of September 11, 2001, the project was seen as being too sensitive. In 2007 Coppola stated that "I have abandoned that as of now. I plan to begin a process of making one personal movie after another and if something leads me back to look at that, which I'm sure it might, I'll see what makes sense to me." In April 2019, Coppola announced that he has plans to revived Megalopolis. In the 2002 poll of the Sight & Sound publication, Coppola ranked No. 4 in the Directors' top ten directors of all time and No. 10 in the Critics' top ten directors of all time. He featured at No. 17 in MovieMaker Magazine's 25 most influential directors of all-time. He also ranked No. 9 in toptenreviews' list of top directors of all time and at No. 21 in Entertainment Weekly's top 50 directors of all time. Three of his films feature in AFI's 100 Years...100 Movies: The Godfather (at #2), Apocalypse Now (at #28) and The Godfather Part II (at #32). The Godfather also ranks at No. 11 in AFI's 100 Years…100 Thrills. 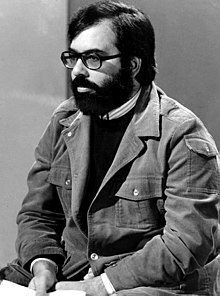 The following Coppola films were also nominated for the list: American Graffiti (1973) – Producer; The Conversation (1974) – Director/Producer/Screenwriter; Patton (1970) – Screenwriter. ^ a b "An Interview with Francis Ford Coppola". ^ "Points of Pride – Hofstra University, New York". www.hofstra.edu. ^ a b c "Francis Ford Coppola Biography and Interview". www.achievement.org. American Academy of Achievement. ^ "An Interview with Francis Ford Coppola". achievement.org. ^ "Francis Ford Coppola(1939–):Biography from Baseline's Encyclopedia of Film". Retrieved 2010-10-27. ^ Tecnologías, Developed with webControl CMS by Intermark. 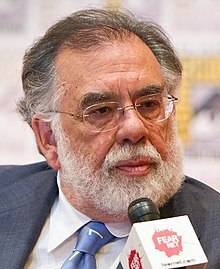 "Francis Ford Coppola, Princess of Asturias Award for the Arts – Communication – The Princess of Asturias Foundation". ^ "15th Moscow International Film Festival (1987)". MIFF. Archived from the original on 2013-01-16. Retrieved 2013-02-21.